Instead of teaching the dog, let’s allow him to learn. There is a subtle but important difference between this concept and that of compulsory, dominance-based obedience training. The best we can do for dogs is to present the opportunity for them to learn and to be successful instead of putting them through boot camp. Be willing to enter the realm of that which cannot be taught in a book or a classroom. Happy training combines scientific method and mindfulness, communication and common sense, ethology and ethics. Dogs come equipped with certain innate knowledge–instincts designed for survival, such as breeding and hunting. Beyond this preordained knowledge, dogs must learn the rest of what they need to know about life. We are their teachers of how to live life in the human world. 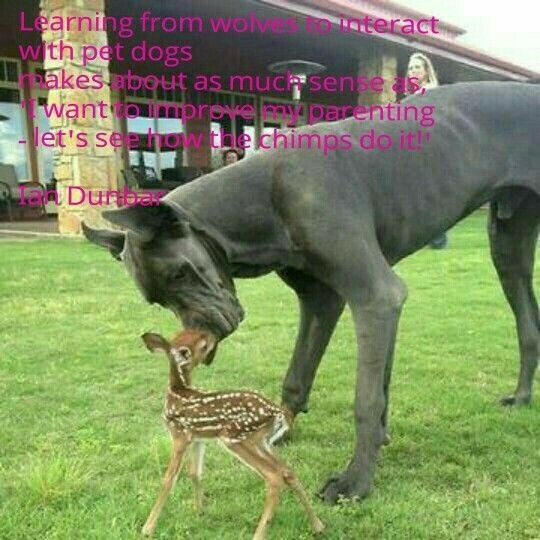 Dogs learn from environment and experience, as humans do. At birth, puppies begin to absorb information from their littermates, parents, other dogs, and humans. They can learn by imitating the behavior of other dogs, and they will experiment to find out what behaviors work. They learn the consequences of their behavior. Effective training takes all of these things into consideration and channels them into learning through open lines of communication and understanding. Positive: Both positive and compulsory training methods work. However, there is a difference between simply acquiring a behavior and having the dog learn. A positive approach does not damage the relationship between owner and dog as other methods can. In fact, it strengthens it. Positive methods respect the individuality and spirit of dogs. Motivation: A dog must be motivated to do a behavior. Rewards are motivation, a paycheck in human terms. Food is a motivator for most dogs and easy to use. However, don’t overlook toys, play, exercise, praise, and affection as inspiration. Rewards are anything the dog likes. At times, you will need to increase the motivation by increasing the value of the reward. While lower value rewards work well when distractions are low, situations that are more difficult require a higher-value prize. However, if the dog refuses rewards, he may be too distracted or stressed, and we need to adjust the environment accordingly. Corrections: Corrections are not punishment, but feedback. They are verbal cues used to interrupt the dog from the behavior and redirect him. Time outs can also serve as corrections by giving the dog a short (30-seconds) break, so that you can both regroup. Textbooks and scientific research discuss learning theory, methodology, and scientific principles as applied to dog training. It’s valuable information. However, experiments are done in sterile, consistent laboratories with animals (such as rats, not dogs) given limited options for their behavior and monitored by unfailingly accurate, data-spewing computers. That is just not the same as training a dog to walk nicely on leash through a park full of tantalizing, taunting squirrels. We are inconsistent humans training dogs in an environment with many distracting elements. We need to know and understand the science of the laboratory and how to apply it intuitively to life with Fido. Remember that Fido did not read the research and analyze the data. Training with both our minds and our hearts builds a bridge between the real laboratory and real life. Successful training comes from the heart as well as the mind and contributes to the wellbeing of both teacher and student. This was vividly illustrated in a consultation I did with a family that had adopted a five-year-old mill dog. The dog displayed fear aggression by barking and nipping, especially at the nine-year-old daughter. The family had been advised to put their hands on their hips, get “big,” and march past the dog when he displayed this “naughtiness.” They were told that doing this would prove to the dog that they were dominant and in charge. When I explained that we would no longer be doing that (and why), the little girl let out a sigh of relief and said, “Oh, good!” She knew that what they’d been doing was not what was in her heart. Within the hour, using science-based training methods, we had the dog voluntarily approaching the girl and touching her hand. It was something everyone felt good about–a positive, touching experience of nose to hand, mind to heart, and heart to heart. Contact Pat at Peaceful Paws • 303-364-4681 • http://www.peacefulpaws.net • pat@peacefulpaws.net. Pat is the author of Taking the Lead with Jerking the Leash available on Amazon.